We have an unlimited collection of all of the 1950’s Best Men’s Costumes in Dallas, DFW, North Texas or Anywhere. This Elvis 1957 Gold Suit & Gold Shoes is what he wore at the Chicago International Amphitheater Concert. 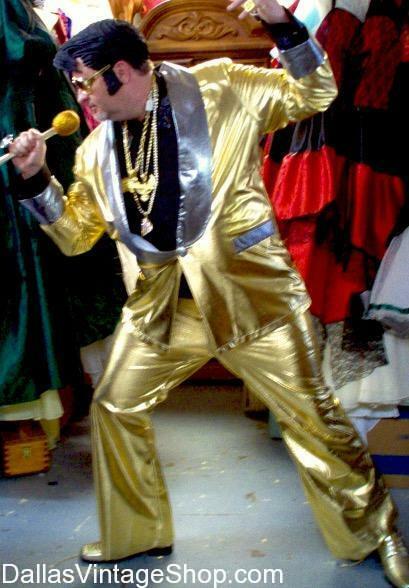 We have many of the 1950’s Outfits and Elvis Costumes from throughout his life. Remember, we also have all of the Most Iconic 1950’s Hollywood Stars, 50’s Rock Stars, 50’s Classic Movie Characters, 50’s Historical & Theatrical Outfits and all the 50’s Hairstyle Wigs, 50’s Jewelry, 50’s Shoes, 50’s Glasses & Sunglasses and other accessories that are worthy of our Supreme Quality 1950’s Best Costumes. Nobody has more 1950’s Attire, Vintage Clothing, Quality Reproductions, Costumes, Wardrobes and more Fantastic Extras than you would ever imagine. We have everything you need for your 50’s Sock Hop, Theme Party or Halloween Costume.